The East Point/College Park Alumnae Chapter has held an annual Jabberwock Scholarship Pageant since 1984. Today, we now continue the tradition biennially with 2019’s theme, “A Timeless Journey into the Past: Embracing a New Future.” The Jabberwock Scholarship Program consists of five components that support the sorority’s mission and Five Point Programmatic Thrust; Educational Development, International Awareness and Involvement, Economic Development, Physical and Mental Health and Political and Mental Health. Each component is strategically planned to integrate relevant youth challenges, issues and concerns with practical solutions, techniques, and life skills to enhance young adult development. The young ladies will participate in a cultivating program over several months tasked with raising funds by selling ads and fundraising earmarked for scholarships. 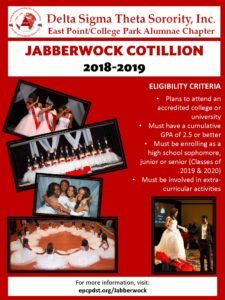 The young lady who raises the highest amount of money throughout the program, will be crowned “Miss Jabberwock” at our culminating cotillion. 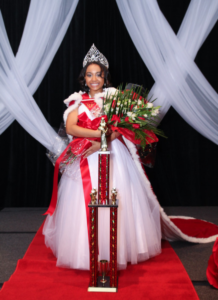 In recognition of her efforts, Miss Jabberwock will receive a percentage of the funds raised to be used toward funding her college education. Additionally, scholarships and other awards and prizes will be provided to runners up, correlating to the amounts raised (subject to the Jabberwock rules and guidelines). To register for the 2018-2019 Jabberwock Scholarship Program, please click here.